Great gift idea for him or her. 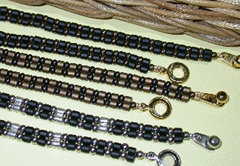 Quick to stitch using size 8 Delicas and size 8 seed beads and an easy flat cobra stitch. For a feminine look choose delicate silver lined colors.